Stay up to date on the international feed, dairy, pig, poultry and arable industries with Misset International. Consisting of 5 dedicated multimedia brands: All About Feed, Dairy Global, Pig Progress, Poultry World and Future Farming, Misset International is the gateway to these global industries. Aimed at the international poultry industry, Poultry World is our multimedia brand providing insight information on all aspects of the poultry business. Poultry World provides the latest market and scientific insights on poultry health, diseases, poultry nutrition, hatchery practices and housing. It also keeps you informed on global poultry meat market reports and disease outbreaks through our interactive poultry health dossier. 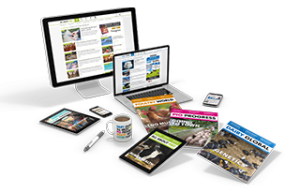 Pig Progress is the key source for the international pig/pork production industry, providing indispensable information for farmers, breeders, vets and service companies. This multimedia brand offers unique and independent insights into pig production all over the world, both on a country level and from a farmer’s perspective, bringing you all the background information on health and nutrition issues. To reach your target audience in the Misset International Industry market, you need the right combination of media, access to your target market, timing and creativity. Our team of professionals are ready to help you reach this goal. Contact our sales team, they are always happy to talk you through all the options available to create your multimedia campaign.